The morning of our #DisneySide Princess Valentine's Day party started with Princess music, along with baking, decorating and a delicious cup of Twinings Pomegranate & Raspberry tea. We put together goodie bags, filled out Valentine's Day cards and simply enjoyed each other's presence. My girls couldn't wait for their family and friends to come over, but of course Winter Storm Faith had other ideas. Due to the snow a couple princesses couldn't make it and some showed up late. Regardless everyone had a blast. 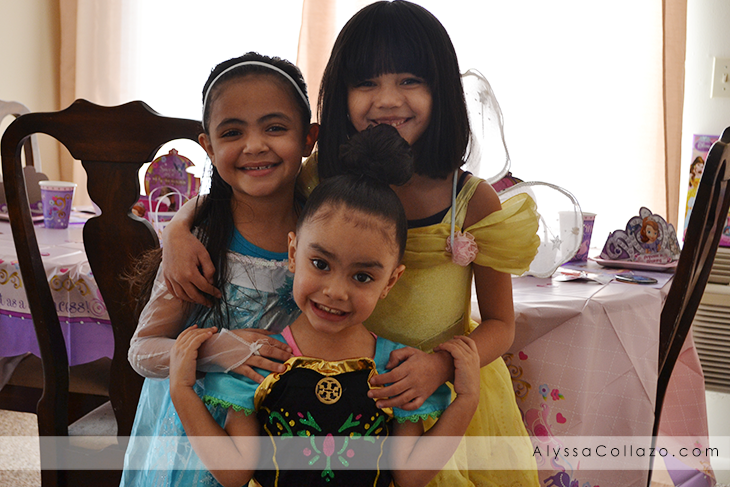 Here are some pictures from our #DisneySide @Home Celebrations Princess Valentine's Day Party. Thank you to all of the Sponsors! We truly had so much fun showing our #DisneySide. We are definitely ready for our trip to Disney World this coming May - 92 Days and counting! We cannot wait. DISCLAIMER: I received free products in order to host a Disney Side @Home Celebration. All opinions stated are my own and are not influenced by any affiliates. What a fun idea. We are having our party in a few weeks, but I think we are going more with a Big Hero 6 theme! What a super cute party! 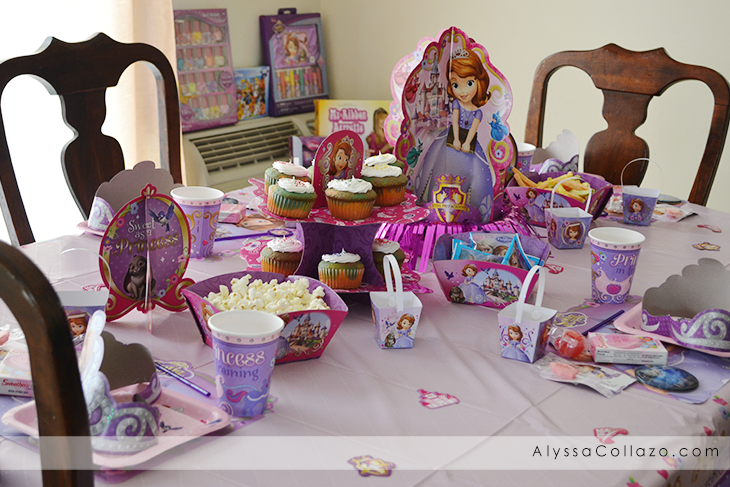 My daughter has had a couple of Disney Princess Parties and loves them. Looks like SUCH a fun party! Love all of the decorations and snacks! Aww everything looks so beautiful! Oh that is amazing! I actually want to have a party like this for myself! lol! Love the Disney princess party! My daughter loves the Disney princesses and we can't wait to plan a trip to Disney for both of our kids! Looks like you guys had a great time. Hope your Disney trip is wonderful! Everything is so cute. I love the heart-shaped sandwiches, I could do those even with my boy over here. He'd love it! You have everything set up so gorgeously! My daughter would love a party theme like that. We are hosting ours next week! I can't wait. We have the Cars party. What a wonderful party with lots of fun finger foods. 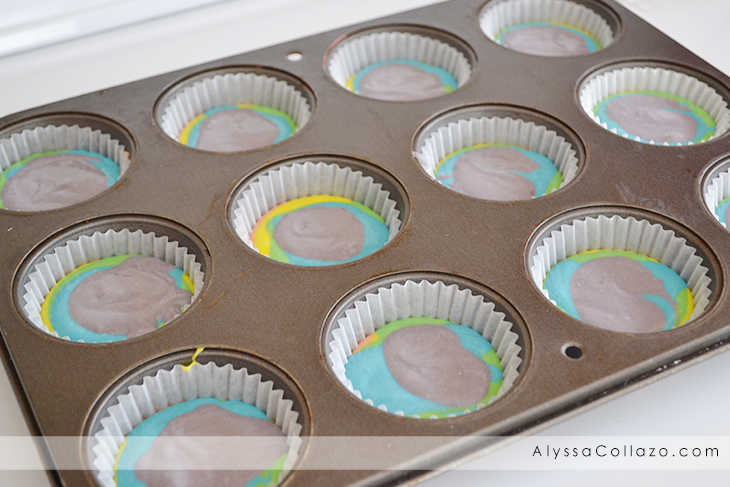 I love those tie dye cupcakes. Yum. Awww I wanna come to the party too! Three little princesses in seventh heaven. You're such a good mommy & what I think is the frosting on the cake is you took the time to make little heart peanut butter & jelly sandwiches. That is just too too cute & so precious! You're the Queen of the Party is what you are! How wonderful... I don't have any little girls in the family anymore... all boys!!! :( Anybody wanna play GI JOE??? LOL Thanks for sharing. We got to host a Disney side party and got the same theme! The girls are adorable. They look like they had lots of fun. I have never attended a disney themed party before and hope to one day too plus when i have kids it will be on the menu every year lol. 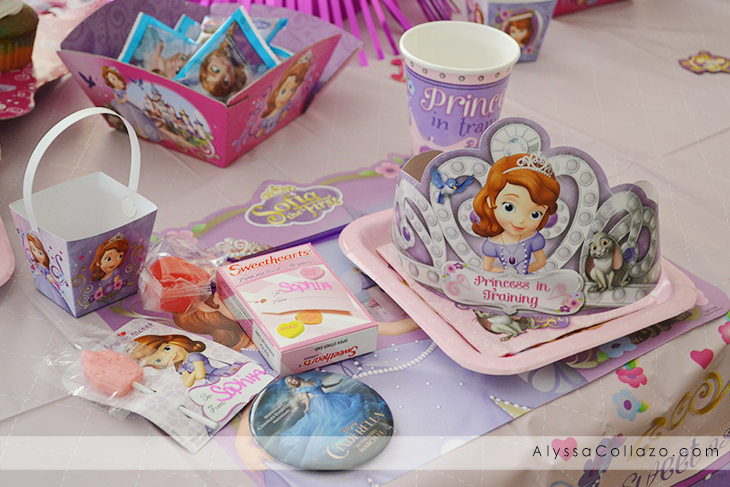 I love the princess Valentine's party and I'm sure my daughter would love this set too. Sophia the 1st is one of her favorites. You can't go wrong with a princess party and little girls. My girls loved all the Disney princesses. What a great idea. 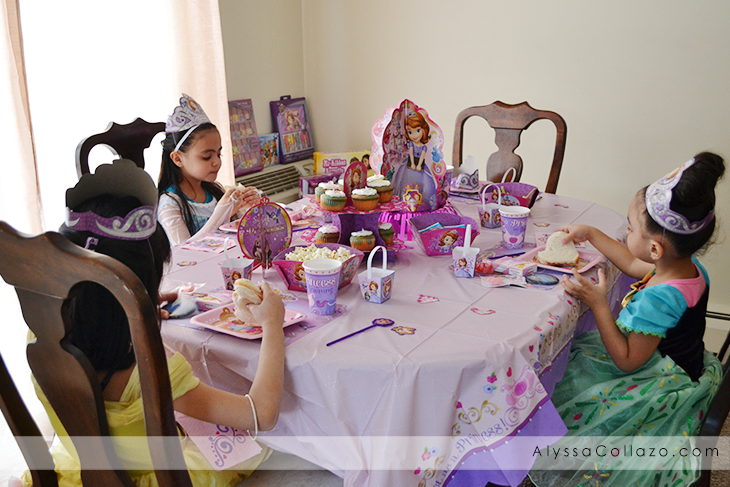 A princess party. My granddaughter would love a party like this. I know she had fun. The party looked like a lot of fun..I would have loved something like this as a lil' one - especially if it meant dressing up as a princess. 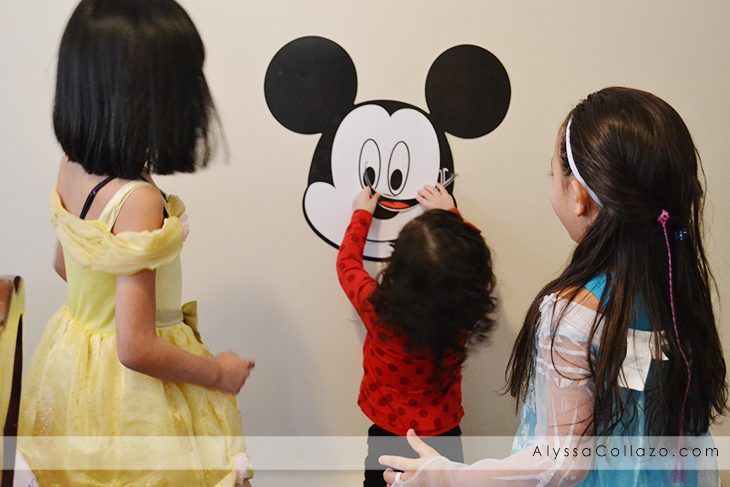 The Mickey Mouse wall game looks like a lot of fun too. My little princess would have loved to be there! She loves everything princess, and we ended up spending Valentine's Day unexpectedly visiting my grandma in the hospital! The decor is stunning! My daughter loves Sofia. Looks like the girls had fun. I really want to take my daughter to Disney too. We planning a trip for when she's a little older. Oh my goodness what a cute party! I love the colors you did for the cupcakes. What a precious party idea! Looks like the girls had fun! I love party planning! Thanks for sharing! You did an awesome job! I am repinning this. Your table was adorable! The kids had to love this -- great job. Looks like they had fun. I love the princess party but hate that it's hard finding princesses of color. I like for my girls to see images that look like them. Look at those beautiful princesses! They look like they really enjoyed their princess party. 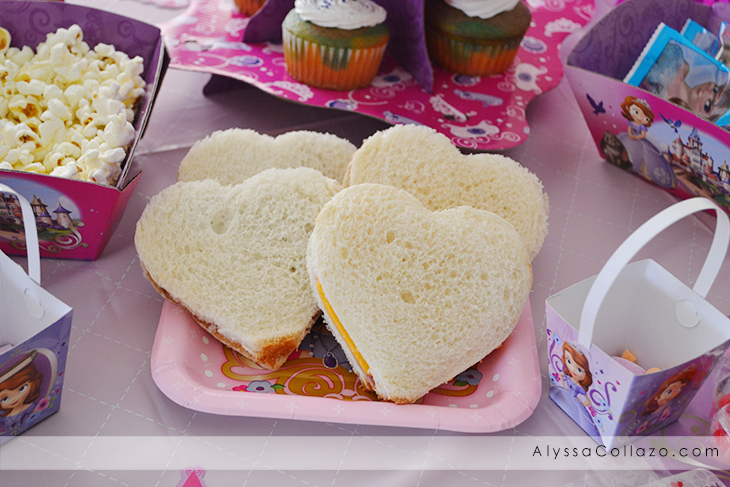 I love the heart shaped sandwiches and all the decorations. Nicely done.